Print postcards that are custom to your brand. Standard postcard printing continues to be popular with all kinds of small businesses for good reason. The tangibility of paper stock and excitement offered by handling something real is a welcome break from the neverending onslaught of fleeting digital and TV advertisements. A postcard grounds recipients to the immediacy and reality of your offers. As a result print postcards are far more effective at creating positive responses. The competitive rates offered by USPS direct mail services also makes them an economical option that punches well over its weight. We print postcards on a selection of durable cover stocks, including a hefty 17 pt. uncoated option. 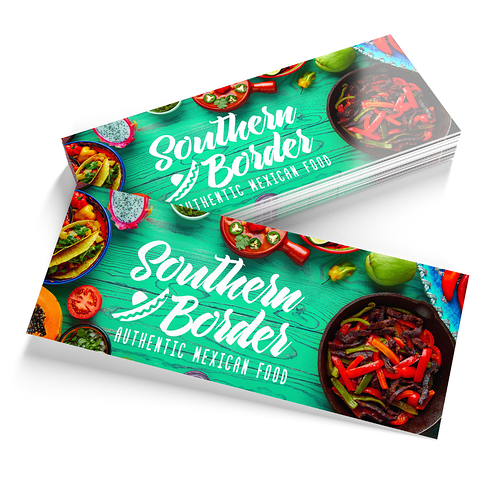 Our postcard size options cover the gamut to help you create cards custom-fit to your project’s requirements.We offer sizes as small as 3.5” x 8.5” all the way to massive 11” x 17” for those with bigger needs. Of course, we also offer popular standard postcard sizes including 4” x 6”, 5” x 7”, and 6” x 9”. We also offer matte, gloss, and high-gloss UV coating to help you create a postcard that closely matches your needs. We also have a 1-day print turnaround time option, so tight campaign deadlines aren’t a problem. Getting your standard postcards is simple. Download our postcard templates in the postcard sizes you need. This will help you with the bleed, trim, and safe zone lines on your artwork. When you’re done, select the options and sizes you need and upload your artwork. You can even choose a shrink wrapping option for bundles of 25, 50, 125, and 250.